Future by Design offers Design Thinking Training in Cape Town, Johannesburg and across South Africa. We have recently engaged a team to offer Design Thinking Training in Dubai and the Middle East as well. 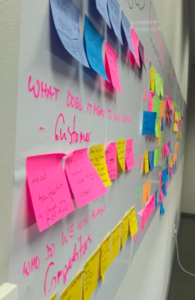 The key leave-behind is our Design Thinking Toolkit which will remain as a manual which will assist delegates to run and facilitate a Design Thinking process of their own on various challenges which arise within the company. Design Thinking, while fairly obvious in nature, requires some theory to clarify the reasons for each of the steps to be taken and also to equip delegates with a “beginners mind” devoid of predetermined ideas or expectations. Further the establishment of an empathetic mindset is vital for any interaction with customers (or stakeholders). Our approach delivers bite-sized pieces of theory which are then cemented in using our “learning-by-doing” approach, where delegates get to actually define and solve a specific challenge and then run the process all the way to a final outcome. Like all disciplines, proficiency takes time, but the basics are learned very quickly using our approach. What we find is that our Design Thinking Toolkit is equally at home in the board room, where comprehension is high, but people are “time-poor”, as it is in rural situations, where there is often more time available. In many instances Design Thinking is taught with the use of many defined templates. We find this template driven approach fairly restrictive as the approach tend to tick the boxes from one template to the next. Inevitably it may lead to “post-it note” fatigue and creative block as the attention span of the audience drifts. Our approach is less academic and far more experiential as a result of our “learning by doing” emphasis. It also equips delegates to read the situation and the audience and be more flexible in the approach to each session so that the optimal innovations result from the process. We offer Design Thinking Courses, Design Thinking Workshops, and Design Thinking Facilitation Sessions, depending on your requirements. Courses vary from half-day workshops, to Full-day workshops, to 2 day or 5 day design sprints. We have an on-going Design Thinking Bootcamp option where delegates partake in regular weekly or monthly sessions, while being able to attend to their own work obligations in between. Please get in touch if we can tailor make a package to suit your needs.